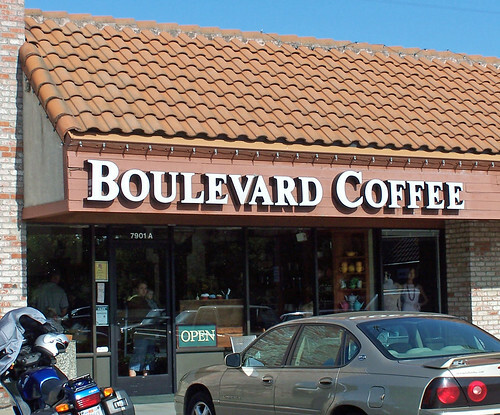 [Boulevard Coffee] is yet another one of the businesses I frequent that doesn’t have a web page. Their coffee is always freshly roasted, and they have an excellent selection. My personal favorites are Boulevard Blend, a good crowd-pleasing medium blend, and Celebes, a dark-roast that may be too intense for some folks. They also have quite a selection of teas and there are always some very tempting desserts on display, but personally I just go for the coffee. The shop interior is done in a very nice mission/arts & crafts style. Between the coffee, the beautiful interior, and the friendly staff, it’s a wonder I ever leave the building! This entry was posted in Uncategorized and tagged coffee, review, sacramento. Bookmark the permalink.